Eggs, rabbits, church - it's that time of the year again. Except maybe without the rabbit. In Bulgaria Easter is probably the only day many people care to step into a church, light a candle and bow their heads in serenity. Somewhat secretly observed through communist times, even in today's age of apathy and atheism, this holiday now has sort of a special power - quite like Christmas, it brings together the whole family. Times have changed and the market now offers many new Easter perks, stores have it as a theme for a month before it happens, silly plastic rabbits flood the windowsills and eventually our own houses. It's all good some might say, because now Bulgarians have more to choose from. It's true. Some of the little Easter decorations are exquisite and simply grab your heart. But what's also true is that most of us had never heard of the Easter Rabbit, Alice in Wonderland aside. Local traditions differ everywhere and one of the perks of traveling is getting to experience holidays in a new way. 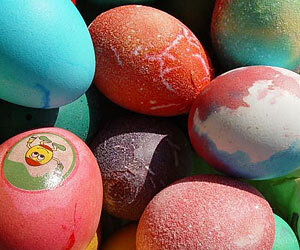 So for those of you willing to try something new, here is a quick peak into the weird customs of Easter. Bulgarian style. Seeing as they are the central part, and a good meal, naturally they should be on top of the list. The first egg is always painted red (home-painted, not bought ready, mind you,) and then it is lightly rubbed in the forehead, chin, and cheeks of each family member, to outline a cross. It is supposed to bring health to everyone. Once all the eggs are nice and colorful and the church clock strikes twelve, another peculiar ritual takes place. Everyone grabs an egg and bangs it against another person's egg. The one whose egg comes out of the whole banging series intact wins. It's hard to say exactly what they win, apart from the pride thing, but it is a ritual fervently observed nevertheless. Often after a session of egg-testing the church yard is left resembling a picnic ground. In the eve of Easter when the clock strikes twelve, Bulgarians circle the church three times with a lit candle. The number of times your candle goes out, is the number of sins you've committed to the year. Then the burning candle is carried home, and placed on the dinner table, to bring the holly spirit in the house as well. So if you ever see a strange procession of people talking that funny language and holding candles along the streets of Madrid, Vienna, Paris, or Brussels during springtime, don't rush calling the loony house. They're probably Bulgarians, celebrating Easter. Some keep those candles and light them on special occasions like Albena Denkova's mother, who always has last Easter's candle burning in the house when her daughter and Maxim Staviiski are competing. One quite relative point here. Orthodox Easter floats around and rarely corresponds with the Catholic holiday like it did this year. It is celebrated in accordance with the lunar calendar and even Bulgarians (believe it or not) need to be told exactly when it's going to take place each year. As far as funny traditions go, this about wraps it up for Bulgarians. No beating around the bush in search of hidden eggs, no legends of rabbits, and no plastic hens on the table. Traditions, however, are not what they used to be and some things have squeezed through the thinning cultural borders. This is why walking down market streets in Sofia, some might easily infer that this country celebrates the holiday in no different way than the rest. Not you, though, for now you know better.